Well, I’ve been meaning to kick off this series for ages, and now it’s finally time! So welcome, dear reader, to Totally worth it, where I share my opinions on rightly remembered classics, undeservedly forgotten almost-greats or just the odd tale about my personal hobby socialisation. Today’s subject was pretty much a no-brainer, though. This time on Totally worth it: The Inquisitor Rulebook. Let me start by saying that something like Inquisitor was, at least for me, totally unprecedented at the time of its release. To understand what made Inquisitor so special, let’s take a look at the somewhat “lopsided” 40k narrative in the early-to-mid 90s: Fascinating as the 40k universe may have been for yound tabletop geeks like us, you couldn’t help but wonder what actually living in this world would look like: Sure, there was the endless war and the huge armies clashing all the time, each with their discreet backgrounds, but at times, it really didn’t feel like a lived-in universe, but rather like something that was only there to provide a backdrop for tabletop battles and winked out of existence as soon as the battle was done — which, in all fairness, was probably the truth of it. It would still take a couple of years for authors like Dan Abnett to flesh out everyday life in the Imperium of Man. So we didn’t have all that much to work with. But then Inquisitor came along, and suddenly it was possible to imagine the Imperium of Man on a day to day basis. For Inquisitor is not a game of sweeping battles with thousands of soldiers: As the caption on the cover on the rulebook states, Inquisitor is about the Battle for the Emperor’s Soul, a shadow war waged in the darker corners of the Imperium, in the places in between. And the world between the cracks is often far more interesting: Inquisitor’s narrative is populated by countless strange and fascinating archetypes, and the rulebook does a fantastic job of fleshing out some of these, while giving the hobbyist just enough information on some of the others to motivate him to get creative himself. Anyone browsing through the Inquisitor rulebook will quickly notice the wealth of narrative potential, with lots of little snippets of background and lore to pick up on. All of this is supported by the book’s great design and production values: From the lavishly illustrated pages to the barcode on the back in the shape of an =][= symbol, the book just oozes style. And while we are on the subject of the artwork: This is where Inquisitor truly shines! All of the character archetypes are accompanied by a wealth of artwork, and even some of the more outlandish character concepts get their own illustrations courtesy of the great John Blanche, who really goes to town on some of the archetypes. I realise that his artwork can be a bit of an acquired taste for some, while others are prepared to state flat out that they don’t like it, period. Make no mistake, however: The man has shaped the 40k universe into what it is today and provided the most compelling and truly original parts of its aesthetics: The gothic madness, the fusion of man, machine and strangely religious iconography. The Inquisitor rulebook brings us a game firmly set in a world that (RT days aside) had previously only ever been hinted at in the background of 40k artwork. So in case you ever wondered what the story behind those strange cherubim, robed figures and demented creatures lingering in the background was, Inquisitor provides the answers you seek – or at least gives you some rather unsettling ideas. Always remember, though, that everything you have been told is a lie! Towards this end, Inquisitor is not just a game system, but a veritable treasure trove of concepts and ideas. There is much talk of the “old” versus the “new” GW, and I usually tend to find such arguments rather tedious – there’s always more than one side to things, for one, and the same, evil capitalist structures transforming GW into the devil incarnate for some hobbyists have also brought us a slew of fantastic and versatile hobby materials that the “old” GW could never have put out on this scale. Plus there have been some marked changes in GW’s policies of late (the new WD, 40k’s return to a much more narrative-driven game) that fill me with a certain optimism. But if there was something the “old” GW was great at, it was putting out whimsical projects like Inquisitor, games that seem to be saying “This rocks! Let’s just do this” at every turn, and where the authors’ and artists’ passion is plain to see on every page: It is very obvious that Inquisitor was a project that Gav Thorpe and John Blanche where very much in love with — and it shows! What’s more, Inquisitor is so great precisely because it does not try its damnedest to appeal to everyone and their cousin. And it is entirely possible to play the game without ever using a single Space Marine – gasp! In any case, GW later tried to capture some of what was great about Inquisitor with the codex releases for Daemonhunters and Witchhunters, porting (or rather: reintroducing) the eclectic and slightly demented aesthetics to 40k proper. The respective army books are quite fascinating, as are many of the models released alongside them. Alas, it didn’t last: The Inquisition today seems to be defined by Codex: Grey Knights more often than not, while the Witchhunters seem to have been let slip under the carpet in the (rather slipshod) Codex: Adeptus Sororitas. In general, it seems that the gothic horror angle has been somewhat pared back in GW’s materials for a couple of years, though the new 40k rulebook shows a certain return to form: Will future releases bring back some of the spirit of Inquisitor, even in regular 40k? I, for one, certainly hope so! In any case, Inquisitor as a game at both ranges is still going strong, being kept alive by places like the Conclave, the Ammobunker or Dakka and by people like Commissar Molotov, PDH, Jakob Nielsen, the Spiky Rat Pack and migsula, to name just a few. And there are lots and lots of fantastic scenarios, character concepts and fanmade sourcebooks for you to discover (most of them at the places I mentioned above). The Inquisitor Rulebook, then, is really just a point of entry to a fascinating hobby world! In case you are interested, my own exploits in this strange and fascinating universe have been collected for your viewing pleasure right here. 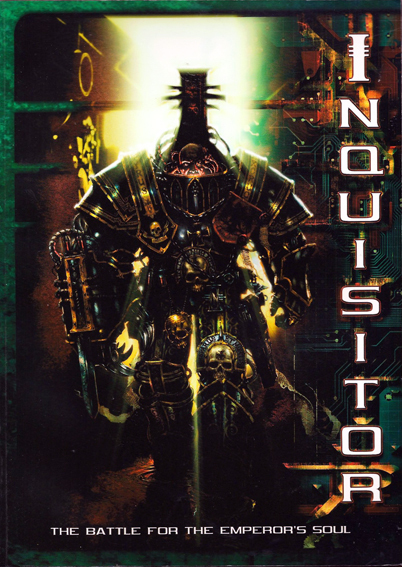 Now whether this post has made you curious and you want to delve into this thrilling and demented world yourself, or you’re just a fan of reading everything about the 40k universe in order to give your games more context, the Inquisitor Rulebook is, of course, totally worth it. And the best thing: A digital version of it can be freely downloaded from the GW website here. Still, the original print version is also very much worth tracking down: It’s a beautiful book, and the extra colour pages detail the creation and painting process for GW’s own 54mm miniatures (as an aside, it is very interesting to see how the ideas behind the defining features of the original Eisenhorn model are completely different from the explanations that later appeared in the novels…) and feature some very interesting conversion ideas. In any case, I cannot recommend this book highly enough! Want to share any insights or remarks about Inquisitor and the rulebook? I’d be more than happy to read from you in the comments section! This entry was posted on November 16, 2012 at 09:00 and is filed under 40k, Fluff, Inq28, Inquisitor, old stuff, Pointless ramblings, Totally worth it with tags 40k, background, fluff, great hobby resources, INQ28, inquisitor, OOP, review, totally worth it. You can follow any responses to this entry through the RSS 2.0 feed. You can leave a response, or trackback from your own site. I do love the concept of the Inquisitor game so very much, unfortunately I’ve never been able to drum up any sort of interest with my gaming friends to give it a go. I still however pore over it quite frequently, because the background, narrative pieces, artwork and hobby sections all come together so well to make a fantastic book. Also, I never took stock in the old 54mm vs 28mm argument. I think hobbyists are free to use whatever they want, it is their game after all. I believe my view of the Warhammer 40,000 universe was probably coloured by influences such as the 2000ad comics, movies like Alien/Dune and books like Ian Watson’s novel Inquisitor (I know they re-released it under the new title of Draco, but I’m unsure whether anything else other than the title was changed). Anyway…. I’d just like to thank you for a wonderful article. To tell you the truth, I have yet to play my first game of Inquisitor myself (although there may be some guys in my vincinity who’ll give the game a try). But seeing the stuff people like Molotov or Neil101 have going on at the moment, I think it’s plain to see that Inquisitor really shines, given the right group of players. And even if you’re not playing at all, the process of inventing, converting and painting characters from this universe can feel like a fresh breath of air (although I doubt that there’s too much fresh air in the Imperium of Man, so I rather meant that figuratively, of course 😉 ). BTW: Wanna play your first game? I recently showed a guy your blog and he was fascinated. Plus, he does play Inquisitor and is coming over for our next convention aka Whfb-Tournament next weekend. Just give me a call!